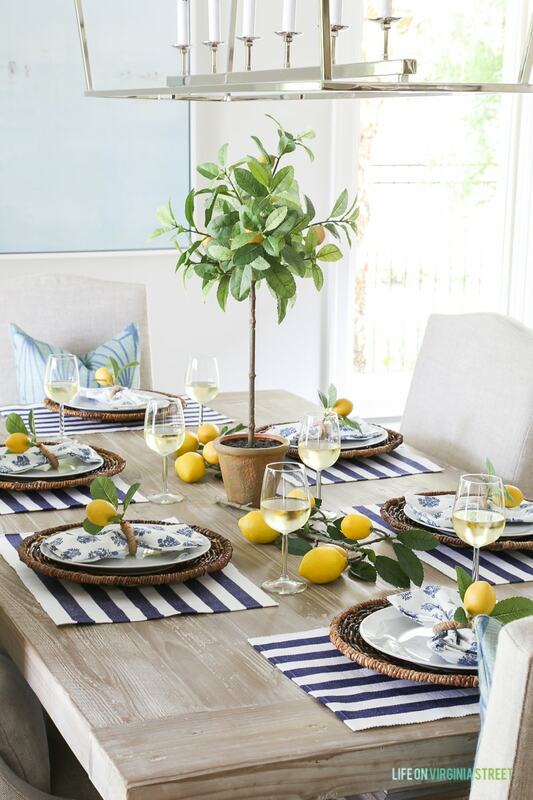 Summer is a casual season and when it comes to having friends and family over, entertaining should be casual and easy too. 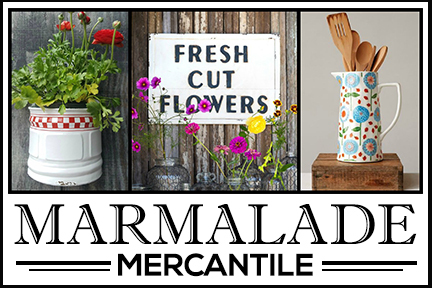 I’m joining fellow bloggers in a summer entertaining series this week. A special welcome if you’re coming from Life on Virginia Street! Sarah always sets a pretty table. And a special thanks to Lory at Designthusiasm for organizing today’s event! I’ve put together a summer table setting that’s quick and fuss-free. My dining table is now in the former living room, giving my guests a little more elbow room. 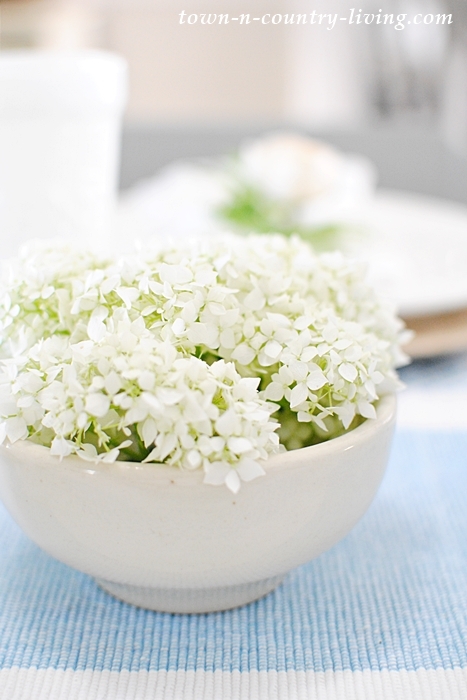 The centerpiece is my favorite white ironstone pitcher filled with silk hydrangeas. Normally I like to use real flowers, but these will last longer. Silk, peach-colored ranunculus adorn each place setting. I used more of these same flowers on my summer mantel that I shared a few weeks ago. 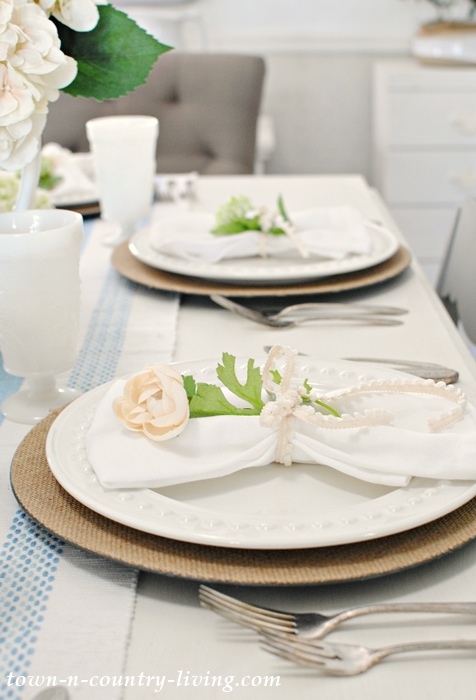 Place a flower atop each linen napkin and tie with a pretty ribbon. I used mini pom pom trim. It’s a quick and inexpensive solution for napkin rings. Milk white tumblers and vintage silverware are favorites of mine. 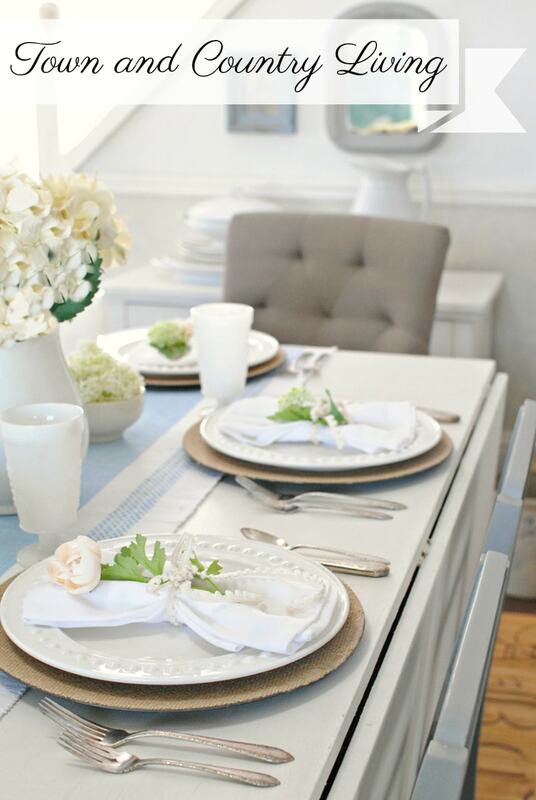 A blue and white table runner and burlap-like plate chargers add a little bit of color and texture to the table. I did clip a couple of white hydrangeas from my bush outside and placed them in white ironstone bowls filled with water. I finally got to use my new end chairs for my summer table setting. 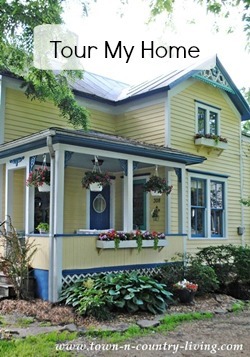 You may have first seen them during my spring home tour. They live in the sitting room next to the vintage mantel when we’re not dining. 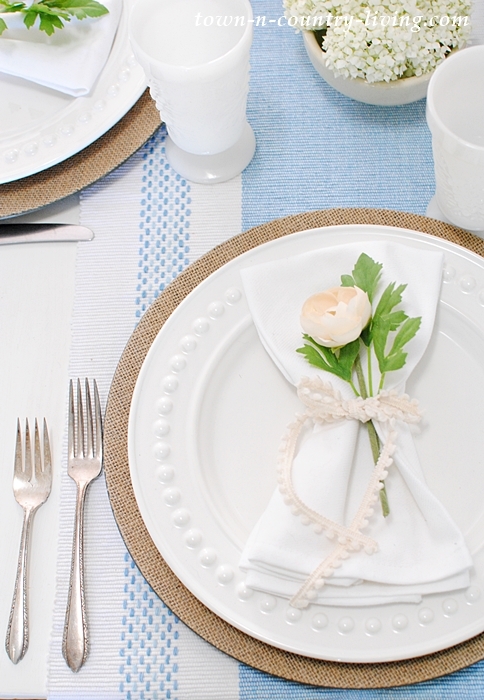 Sweet, simple, and easy to pull together – just like a summer table setting should be! Next up on today’s tour is Celebrating Everyday Life. Jennifer always sets a gorgeous table! 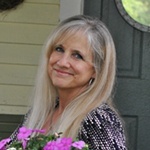 You can visit Monday’s bloggers at the links below. 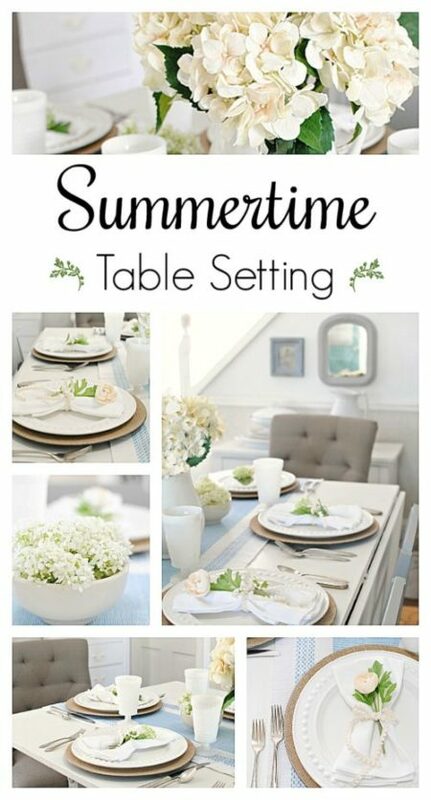 Check back throughout the week to see everyone else’s summer table settings! How so very fresh and beautiful Jennifer! 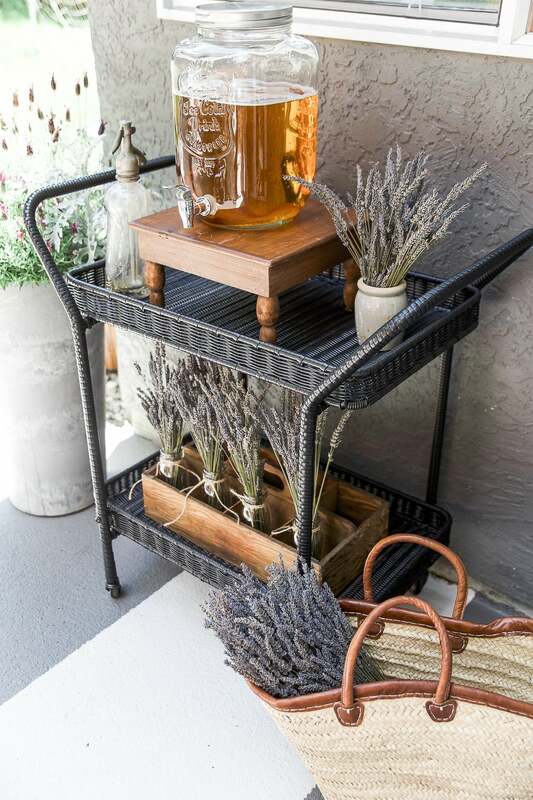 The perfect summer table. 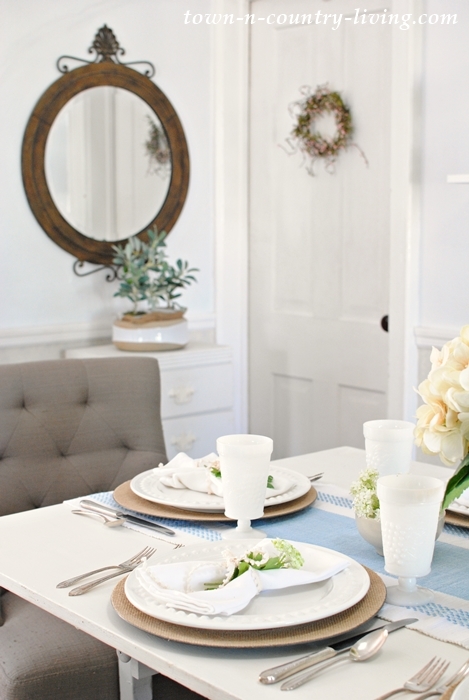 Love those white tumblers and your hydrangeas are gorgeous! 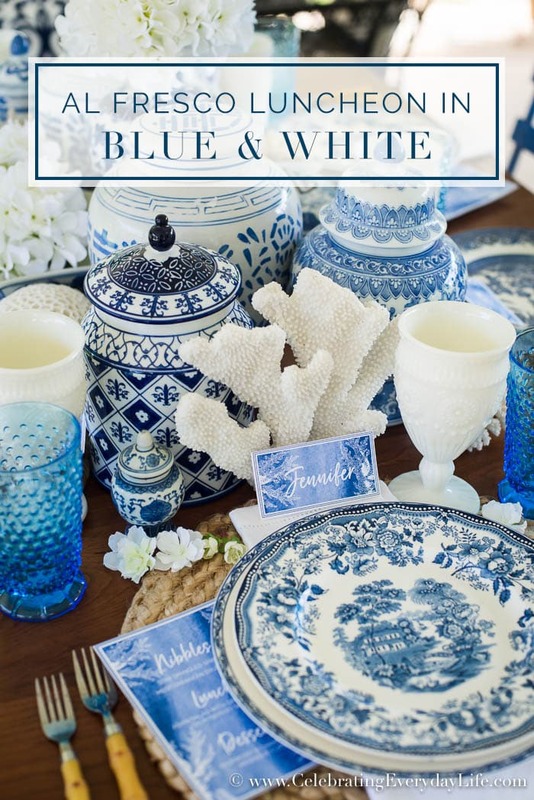 Your table looks beautiful, especially for summer, Jennifer! All white and neutral is always a winning combination. Love the hydrangeas too! I’m excited to be on the Styled + Set Tour with you! 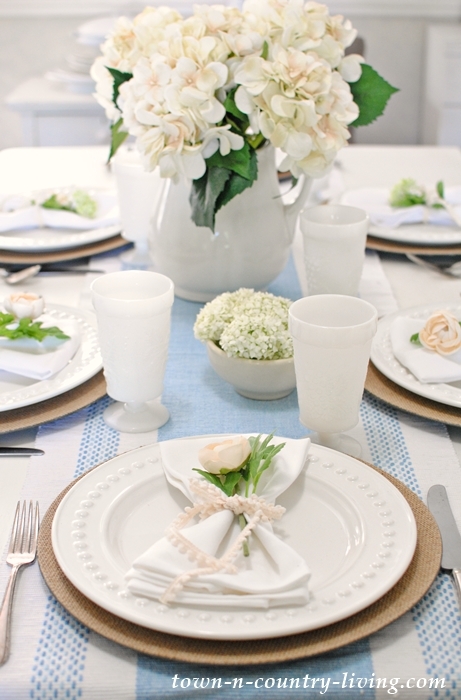 Simple but, elegant, perfect for summer dining. 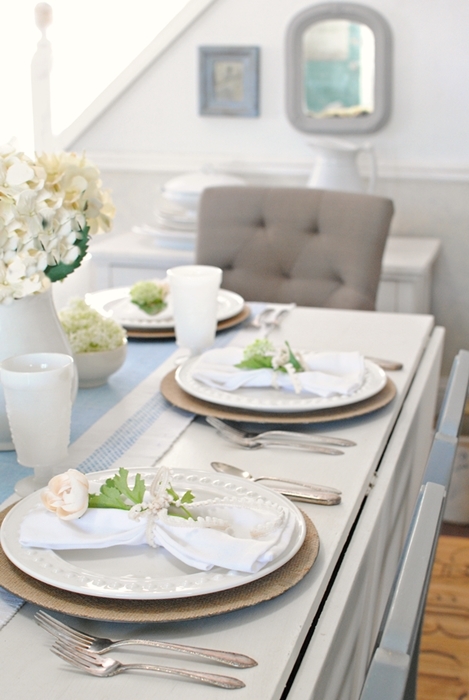 I always loved using white on a table setting. It just makes any colour used just pop. Your table is so refreshing and casual ..it says summer dining at it’s best ! So pretty. I love the soft, fresh colors and the pom pom trim is a cute touch! Jennifer, how aft and pretty this table is! And you completely fooled me with the flowers!! 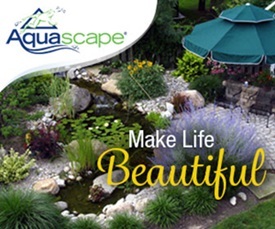 The whole effect is relaxed and peaceful – perfect for summer!! This is so pretty, Jennifer! I love the soft colors and hydrangeas. Beautiful as always, my friend. So pretty Jennifer! 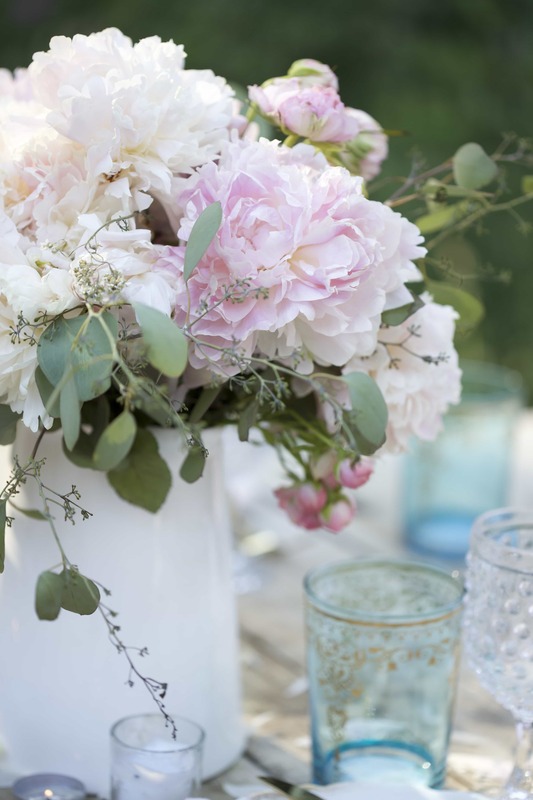 Love your elegant table and those flowers are perfection! 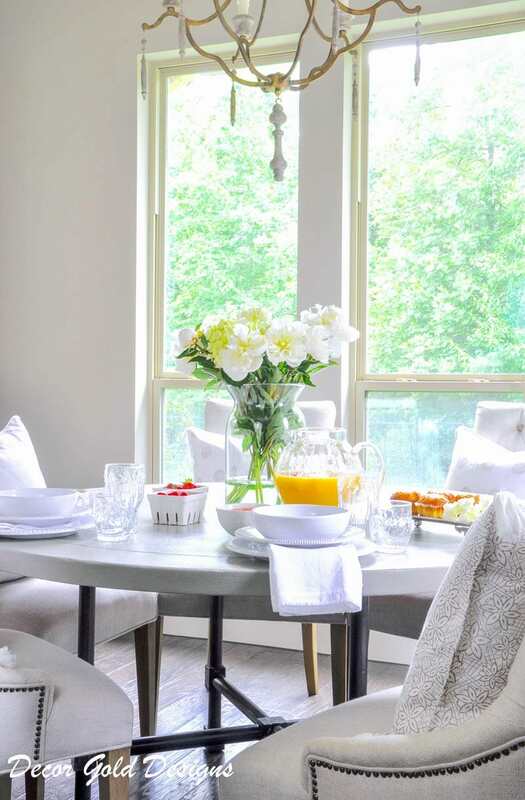 Love your pretty table, Jennifer! 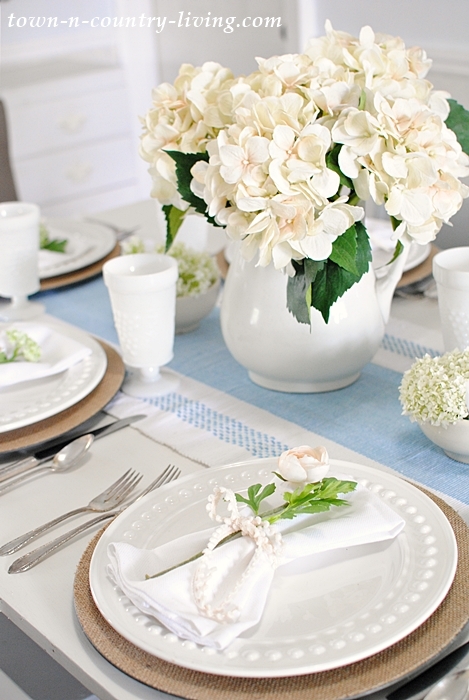 The blue runner is a perfect backdrop for those white hydrangeas!